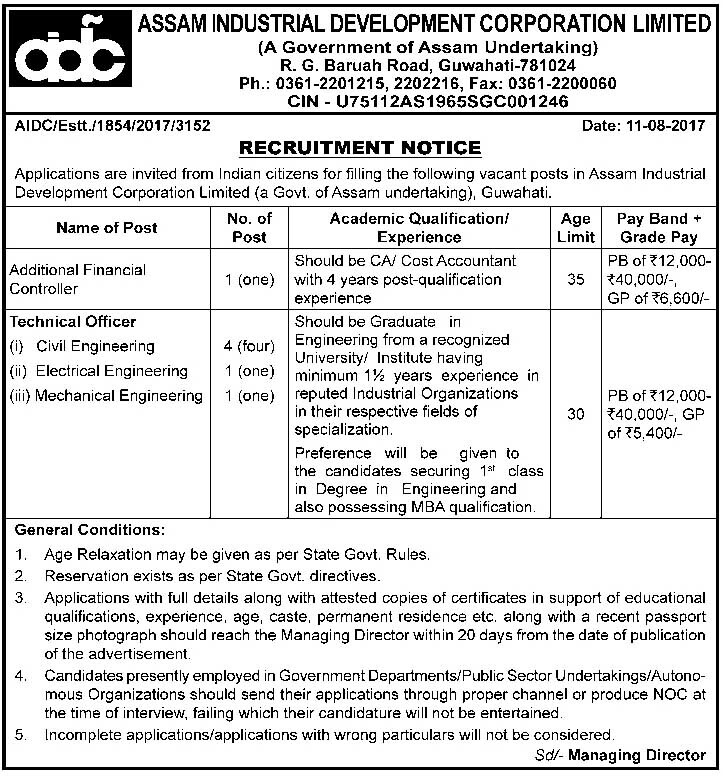 Applications are invited from Indian citizens for filling the following vacant posts in Assam Industrial Development Corporation Limited (a Govt. of Assam undertaking), Guwahati. Name of Post: Additional Financial Controller. Academic Qualification/ Experience: Should be Graduate in Engineering from a recognized University/ Institute having minimum 1 ½ years experience in reputed industrial organization in their respective fields of specialization. Preference will be given to the candidates securing 1st class Degree in Engineering and also possessing MBA qualification. a) Age Relaxation may be given as per State Govt. Rules. b) Reservation exists as per State Govt. directives. c) Applications with full details along with attested copies of certificates in support of educational qualifications, experience, age, caste, permanent, residence etc. along with a recent passport size photograph should reach the Managing Director within 20 days from the date of publication of the advertisement. d) Candidates presently employed in Government Departments/ Public Sector Undertakings/ Autonomous Organizations should sent their applications through proper channel or produce NOC at the time of interview, failing which their candidature will not be entertained. e) Incomplete applications/ applications with wrong particulars will not be considered.